Eyeglasses for Dolls. These realistic Doll Eye Glasses make great accessories for country style dolls, Santa and Mrs. Claus, soft art and more. 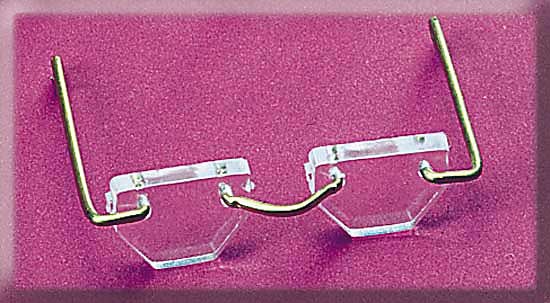 Acrylic lenses and brass wire frames. Authentic Looking Doll Eye Glasses with Clear Acrylic or Tinted Plastic Lenses. brass nose & ear pieces. (A) Oval Doll Glasses 3-1/4"
(B) Half Hex Doll Glasses 3-3/16" RED TAG BARGAIN!!! (B) Half Hex Doll Glasses 3-3/4" RED TAG BARGAIN!! !